Watching the entertainment you love is about to get easier. Today, we’re excited to announce that starting in late January, Premium Subscriptions are coming to the The Roku Channel! In addition to 10,000+ free ad-supported movies and TV episodes, The Roku Channel will soon offer customers the option to add Premium Subscriptions from SHOWTIME, Starz, EPIX and more, making it the one-stop shop for your favorite free and premium TV. Premium Subscriptions on The Roku Channel have a number of convenient features that make subscription streaming easy including the ability to browse all available content before signing-up, free trials for all subscriptions, one-click sign-ups, and simple subscription management with a single monthly bill. Free, live, and premium content will be presented together in a single channel, creating a simple way for you to browse, search, and watch a wide variety of entertainment without switching between multiple streaming channels. Additionally, users with the Roku mobile app for iOS and Android will be able to watch entertainment from The Roku Channel without a Roku device. This means you can start a movie or TV episode on your Roku player or Roku TV and pick up right where you left off on the go. Premium Subscription partners at launch include Showtime, Starz, EPIX, Baeble Music, CollegeHumor’s DROPOUT, CuriosityStream, FitFusion, The Great Courses Signature Collection, Hopster, Magnolia Selects presented by Magnolia Pictures, MHz Choice, NOGGIN, Smithsonian Channel Plus, Tastemade, Viewster Anime and more. Premium Subscriptions and search capabilities on The Roku Channel will begin rolling out to select Roku devices in late January, and are expected to be available on all supported devices in early 2019. The Roku mobile app update will be available soon. Customers can also stream The Roku Channel online at therokuchannel.com. 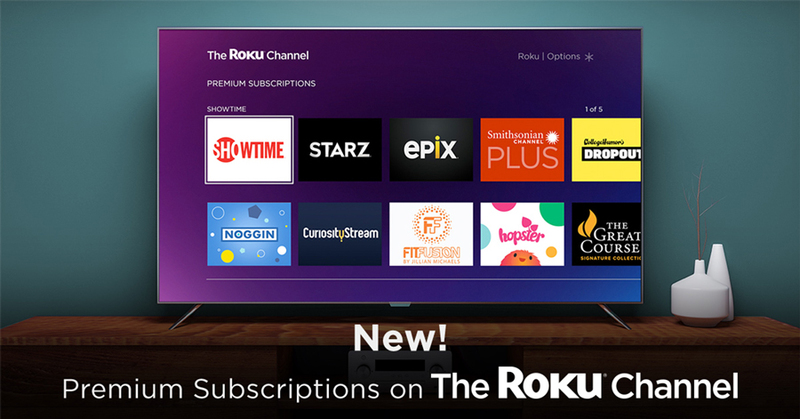 The post Premium Subscriptions coming soon to The Roku Channel appeared first on The Official Roku Blog.